Among the many things that make lead up to the release of a new Star Wars film exciting is all the amazing promotional material, including major publications covering the film. Now with Rogue One: A Star Wars Story just mere months away from release. 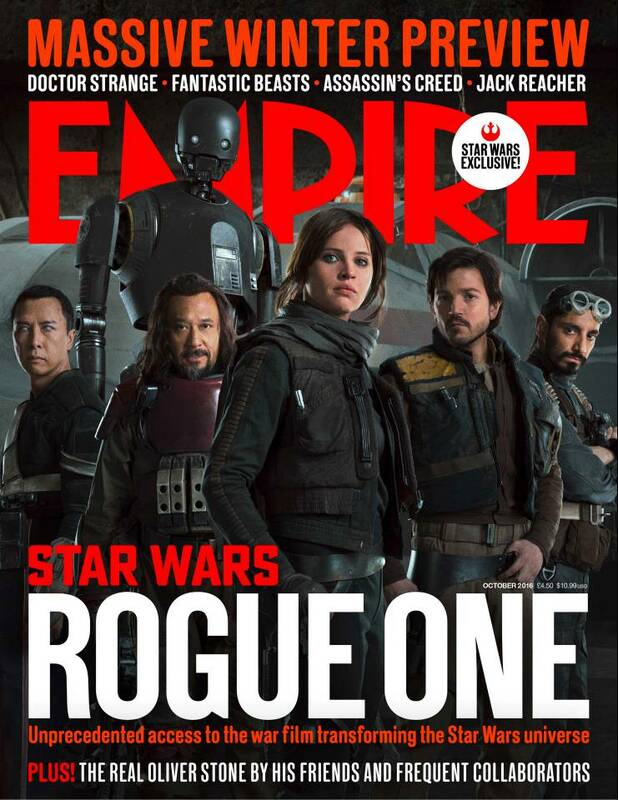 Empire Magazine has unveiled the first of their covers celebrating Rogue One. It features the main heroes of the film, including Chirrut Îmwe(Donnie Yen), K-2SO(Alan Tudyk), Baze Malbus(Jiang Wen), Jyn Erso(Felicity Jones), Cassian Andor(Diego Luna) and Bodhi Rook(Riz Ahmed) with a classic X-Wing Starfighter looming behind them. Empire also teases that they will be revealing a second cover on Friday and a third subscribers exclusive limited edition cover on Monday. The full issue will be available on newsstands on August 25th and promises "unprecedented on-set access to director Gareth Edwards and his crew."